Llŷn‘s New Digital Walks - The AONB Unit, in partnership with the Llŷn Landscape Partnership, has recently developed a series of digital walks based on Nefyn, Pwllheli, Llanbedrog, Rhiw and Aberdaron. For more information or to download the app, click here to visit their website. After following the coast past Porth Colmon you come to the small cove at Porth Widlin and at this spot you head inland for a while before rejoining the sea at Porthor. As you go around the headland you will be in the teeth of the wind and see how the rough seas have sculpted this landscape. Above the cliffs there are wonderful heath lands with heather and gorse shaped into small mounds by the wind. The soil is acidic but supports plants such as thrift and wild thyme. The cliffs themselves offer the best homes for interesting and rare wildlife. This is the stronghold of the emblem of the Llŷn Area of Outstanding Natural Beauty, the chough which you can recognise from its harsh call, red legs and beak. In the spring and summer, when the winds subsides you are likely to hear the call of razorbills, guillemots and various gulls as they mate and rear chicks on the rock ledges. The plentiful lichens, diverse seaweeds, sponges, limpets and barnacles associated with the lower rocks live within reach of the tide and waves. From Uwchmynydd you will see Bardsey Island (Ynys Enlli) once a destination for pilgrims who according to legend made three visits to Bardsey which was equivalent to one pilgrimage to Rome. This small island is reputed to be the resting place for 20,000 saints. 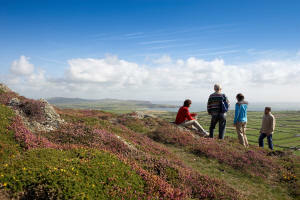 From Uwchmynydd you will once more turn eastwards with your first stop being the quiet village of Aberdaron. After leaving Aberdaron the route takes you away from the coast for a while before returning to the sea at Port Ysgo. This small cove was once a hive of activity during the heyday of manganese mining. In 1945 mining came to an end and today only walkers and fishermen visit Porth Ysgo. After the gentle climb past the village of Y Rhiw you will pass Plas yn Rhiw. This small sixteenth century manor house was renovated by the Keating sisters during the twentieth century and bequeathed by them to the National Trust in 1949. 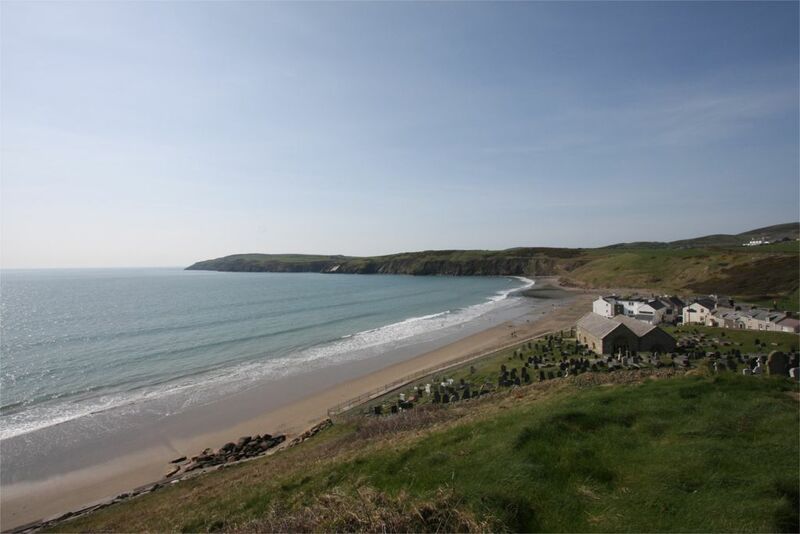 From Plas yn Rhiw you will see the wide expanse of Porth Neigwl or Hell's Mouth, when the tide is out you can follow the beach for about 3 miles before reaching the base of Mynydd Cilan. If you don’t want to venture the length of the beach it’s possible to go inland and visit the historic villages of Llangian and Llanengan. From Mynydd Cilan the route takes you to Porth Ceiriad, a haven for wildlife with bees, wasps,crickets and butterflies of all sorts amongst the creature that live here together with the various seabirds nesting on the cliffs. After departing from Cilan the island of St Tudwal come into view, a sign that you are close to the popular tourist village of Abersoch. Please note that the route shown on the latest maps differs to that shown on earlier versions and in previous publications. Every effort will be made to ensure that signs and way markers indicate the amended line of the path. However, this may not have been completed at all locations, we apologise if this results in any temporary difficulty for walkers.